Following a healthy and balanced diet is rather hard, especially when you’re tempted with chocolate desserts, cheesy pizza, and hot and crispy French fries. It’s so easy to cheat on your diet, but then you naturally feel guilty a few hours later. It’s a vicious cycle that we, at FaveHealthyRecipes, are trying to help you break. We’ve collected these Easy Healthy Recipes: 24 Simple Healthy Recipes for Your Family to make your life easier. After trying a few of these recipes, you won’t feel the desire to cheat on your diet. Instead, you’ll be looking to make more of these easy healthy recipes. On this page, you’ll find only the best healthy chicken recipes, dessert recipes, salad recipes, and casserole recipes. You really can’t go wrong with any of these simple healthy recipes. They’re all just so amazing. Want even more easy healthy recipes? Check out these 32 Low-Calorie Recipes. You are going to love these healthy salad recipes. If you're looking for a light meal, then you can make one of these easy healthy recipes. However, you can also make these salad recipes as an appetizer, side dish, or potluck recipe. There's really no occasion in which these salads won't be welcome. Oh. My. Goodness. You are going to love these healthy chicken recipes. Each of these chicken recipes are hand-picked for your healthy eating pleasure. We recommend that you save these easy healthy recipes because you'll want to make them again and again. These family-favorite casseroles will leave you jumping for joy. 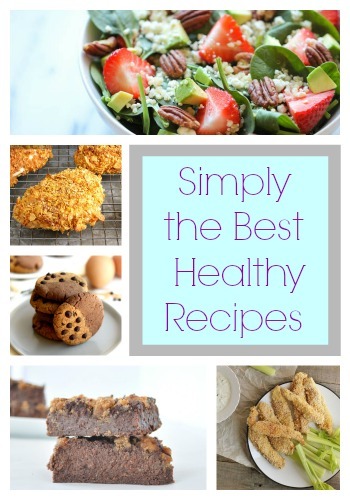 Each bite is absolutely delicious, and you'll be so glad to know that these are all easy healthy recipes. So, you should make one of these casseroles for dinner tonight. Your family will definitely not complain when they see these recipes coming out of the oven. If you like these healthy casseroles, then you'll LOVE these 15 Easy Breakfast Casserole Recipes. You'll have a tough decision when you're forced to decide which of these healthy desserts to make first. Although they don't look healthy, these decadent desserts are the best healthy recipes you'll ever find. So, grab an apron, and start your baking adventure today! Love the recipe for Healthy Chocolate Cupcakes! I have such a sweet tooth and am always looking for healthy(ish) dessert recipes. Can't wait to try the chocolate cupcakes! 100 calorie cupcakes? I can't believe this recipe exists!